Let us tell you about how the earth, the climate and man’s passion for beautiful and natural things come together to create a unique product: Parma Ham. 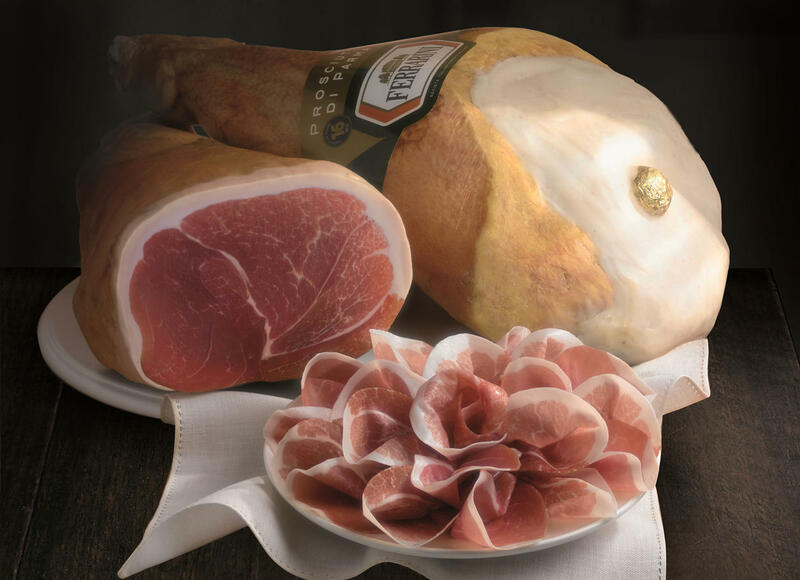 Our large range of Ferrarini PDO cured hams are aged in Lesignano de’ Bagni, situated on the banks of the Parma river, opposite Langhirano, a district renowned throughout the world for its Parma Ham. In our production of Parma Ham PDO (‘Protected Designation of Origin’) the careful selection of raw ingredients and the scrupulous monitoring of every phase of its production, respecting some of the oldest local traditions which are so central to Italianindustry, allow a unique taste to be achieved, while ensuring high quality and authenticity. The taste is reminiscent of flavours and atmospheres of years gone. These elements make Parma Ham one of the most symbolic Italian products and one of the most appreciated and well-known across the world. The sweet and delicate flavours of Ferrarini cured ham develop step by step, through slow and patient curing over at least 12 months. It all begins with careful and consistent salting, following an ancient ritual reminiscent of sowing seeds; parts of the pork rind are treated with wet salt, while the fatty parts are covered delicately with dry salt. In order to use the minimum possible amount of salt, we have a patented method which ensures a predetermined quantity is sprinkled uniformly onto the ham, according to the size of the leg and the technical decisions made by the producer. In Lesignano de’ Bagni, a small town on the banks of the Parma river, opposite Langhirano, a districtrenowned throughout the world for its Parma Ham, we produce our wide range of cured hams. The slow ageing process is monitored in our cellars, with humidity and temperature constantly checked, using innovative technology we created, implemented and patented. This gives our range of cured ham its unmistakable aroma, endorsed by our experts. Our Parma Ham PDO is produced in the green hills of Parma, its flavour resulting from a truly natural ingredient: time. Discover the production process. Why is horse bone used to check the fragrance of the ham? At the end of the curing process, we carry out a number of checks. To check the fragrance, a horse bone needle is stuck into various parts of the muscle. This material is chosen due to its ability to absorb the aroma of the product, but then return to normal very quickly, so when the needle is used later, on a different meat, it will only absorb the aroma of that meat. The needle is ‘smelt’ by experts trained to recognise and evaluate the meat’s aromatic qualities, in order to make sure the production process is going well and that the unique sweetness of this meat is preserved. (Link to the Parma Ham Consortium). How should I store it in the fridge and for how long? Cured ham sold in a plastic tray should not be wrapped in non-breathable films, which would prevent transpiration and accelerate microbial alterations, including the development of mould. Therefore, products should be kept in the fridge and consumed within 36-48 hours of opening. Slabs of ham should be kept wrapped in disposable paper or clean tea towels. Sugnatura is a special process that involves softening the muscular layers on the surface of the product using fat, ensuring the outer layers do not dry too quickly compared to those inside, though still allowing the loss of moisture. The fat mixture used — the sugna — is not considered to be an ingredient by Italian legislation and is thus treated as a butchery product; it is completely natural and contains no preservatives. Ferrarini Parma Ham PDO can also be bought in handy plastic trays, allowing it to be served easily at the table for all the family to enjoy. The Ferrarini plastic trays help you maintain a healthy and balanced diet, at any time and in any place, thanks to their handy packaging which retains the nutritional value of the product for a long period of time. The product is 100% Italian and 100% natural; perfect for a healthy and balanced diet. The pig meat used is exclusively Italian. The skills of the professionals who salt the meat as well as the dry and delicate air in the area’s hills are the simple ingredients which create its unmistakeable sweetness and flavour. The acronym PDO stands for Protected Designation of Origin, and indicates products intrinsically linked to the geographical area from which they take their name. They are characterised by very specific conditions: the production of raw materials and their transformation into the finished product must occur in the area from which they take their name, and the quality or characteristics of the product must be able to be traced back to the geographical area of origin, in terms of natural or human factors such as climate, soil quality and local expertise. A very special variety of pig is chosen to produce Parma Ham. The pigs are born and raised in ten regions in central and northern Italy (Piedmont, Lombardy, Veneto, Emilia-Romagna, Tuscany, Umbria, Marche, Lazio, Abruzzo and Molise). They are fed with quality food (sweet corn, barley and whey from the production of Parmigiano Reggiano PDO Parmesan cheese) and grow to a size of around 160 kg and an age of 9 months. All of these criteria must be met — as certified by documentation and a tattoo applied by the breeder — for the pig to be used in the production of Parma Ham. (Link to the Parma Ham Consortium).